My sister and I will be embarking on an adventure this summer. We will be biking from South Carolina to California to raise awareness about Affordable Housing efforts with an organization called Bike and Build. We will be building houses and biking across the country. We each are required to raise $4,500 to participate in the trip. Most goes to the charity we are working for and the rest goes to paying for food for the trip. We have been working hard towards reaching that goal. -->Asking for 10% of all proceeds from a local kitchen appliance store- Kitchen and Spice and other things nice. Our first fundraising event was held at Gainesville's local Farmer's Market. We tabled and talked about Affordable Housing efforts, our trip and met a lot of people who were interested in helping our cause. Our second fundraiser was held at Kitchen and Spice, a local kitchen appliance story, that allowed for 10% of all sales be donated to our cause. April -->we will be holding a Scavenger Hunt on bikes race. Not having a car anymore has made sure we train every day. From going to business meetings, to meeting with various donors and clients we are forced to use our bikes all across town. Freewheel Cycling: Gainesville's newest Bicycle Collective scheduled to open in May hosted a Valentines Day themed Alleycat Race. We ended up as second Female-Female team and biked over 22 miles throughout the city having to do different tasks at each checkpoint. This is similar to what we will be holding in April to raise money for our Bike and Build tour. Freewheel Cycling used to be home to a sign making business but is now being transformed into a bicycle collective where bike enthusiasts can meet up and discuss bicycle related issues in Gainesville and play bike polo. 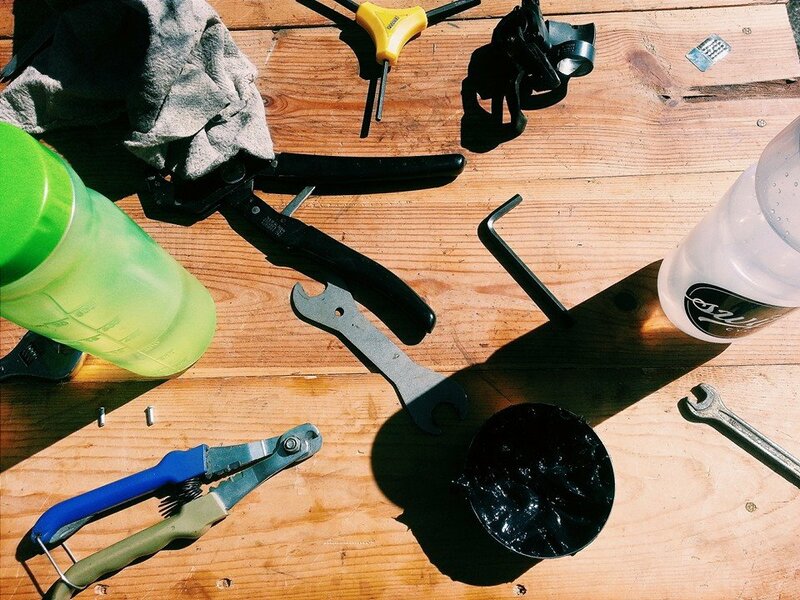 Freewheel Cycling: Gainesville's newest Bicycle Collective is scheduled to open in May. Located on South Main Street next door to the Gainesville Rock Gym. Freewheel Cycling: Gainesville's newest Bicycle Collective scheduled to open in May hosted a Valentines Day themed Alleycat Race. Freewheel Cycling used to be home to a sign making business. Lead and I are taking it upon ourselves to learn about bike maintenance you know just in case we get stranded somewhere between Texas and Oregon. We are learning through the Kickstand a local bike repair shop that donates all old bicycles we make over to various charities. The Kickstand is a free bicycle clinic that teaches bicycle maintenance while working on bikes that will be donated to those in need.